Cheri is hosting a mystery quilt. You're supposed to have 6 deep dark fabrics, 6 medium dark fabrics, 6 medium fabrics, 6 medium light fabrics, and 6 clear fabrics. 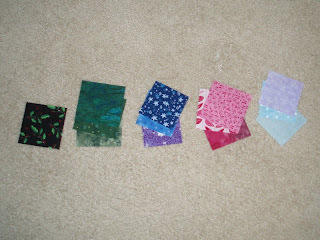 Okay I'm not too good with fabrics so what I did was 1 deep dark fabric and 3 each for the rest.